Peter Asselyn says he found it in a N.H. woodworking shop. Durham- Peter Asselyn may be holding the fate of the world in his hands-or at least in his woodshop. Come the stroke of midnight,Jan.1,2000, the world can rest assured. Thanks to Asselyn, the Y2K bug has been caught and caged. So pop open your best bottle of bubbly, take to the streets and welcome the new millennium without fear. Wait a minute. Hold your corks and muffle the noisemakers. Y2K is actually a bug? And it’s in Durham? According to Asselyn, the Y2K bug is real and he has it captured and caged in his shop on Route 9. Asselyn, an artist who specializes in wooden crafts, said he stumbled upon the Y2K bug hidden among several pieces on a shelf of a woodworking shop in New Hampshire. The bug is actually a rare manzanita root originating in California. To Asselyn, the mangled root is the definition of the Y2K craze. At close observation, the root takes on the shape of something out of the Alien movies. One can point out its scaly back, pointy fangs, beady eyes and clenched claws grasping onto a stone, hunched over and ready for its next capture. That is, until Asselyn beat him to it. Set on a round base of wood, the bug is positioned in the middle of a set of circles signifying its capture. After retiring from his job at Nynex in 1995, Asselyn turned his attention to his love of wood. Over a year ago, Asselyn joined forces with the Maine Woodturners Association, and turned his hobby into a profession. Asselyn recently opened his first show at the West Island Art Gallery in Bath. 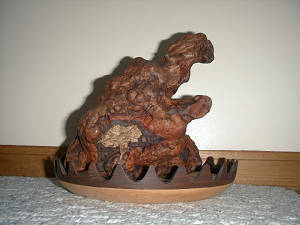 On display are 10 wooden creations, mostly bowls, that Asselyn created in his wood shop with logs from his backyard. Although each bowl is unique, Assely likes to keep natural edges, giving his pieces primitive and raw looks, something he picked up from African traditions. Asselyn did little to disrupt the natural character of the Y2K bug. Although the Y2K is not part of the show in Bath, Asselyn is willing to show it at another gallery or even sell it to a responsible buyer. But he wouldn’t want it to get into the wrong hands. “It’s a special piece,” said Asselyn. “It’s going to take a particular type of gallery or customer to buy it”. Asselyn hopes that this piece will bring back some of the sense of humor that should be involved in the Y2K craze. The craze, of course, has to do with fears that the world’s computer system will crash the moment the date changes from Dec.31,1999, to Jan. 1,2000. For those interested in seeing the Y2K bug “in the root,” call Asselyn at 207-353-4206.
take over the guardianship of this beast.